Ethiopia's historic journey is long and many ruins can be seen in the country. A good example of this is the former settlement of Yeha which is believed to have been built around 800 BC. Yeha, the country's pre-Aksumite foundation of Ethiopian civilisation, is situated between Aksum and Adwa in the province of Tigray. The towering ruins of Yeha's Temple are in such good condition today that they have become one of the tourist attractions of historical significance. After Yeha had fallen, the town of Aksum was established in 500 BC, which became the ancient city of Ethiopian civilisation and a powerful kingdom. The Axumites were renowned for their fine architecture, crafts and skills, in particular as masons and metal workers, which they retain to this day. Greek traders knew Aksum as centre of an empire, which had trade links with India, Arabia, Rome, Egypt, Persia and Greece. 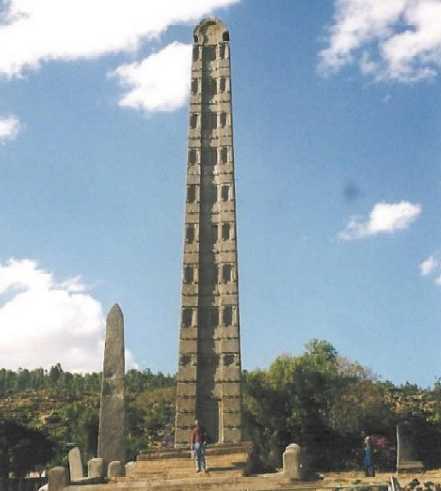 Today, Aksum abounds in archaeological remains and great granite stone curved obelisks known as Stelae. The Stelae are royal tombs or memorials. A large part of the history of Ethiopia is centred on the legend of the Queen of Sheba of Ethiopia and King Solomon of Israel. Many Ethiopians believe that the relationship between Sheba and Solomon resulted to a son who founded the Solomonic Dynasty in Aksum. According to Ethiopian traditional history the Queen of Sheba learned about the wisdom of King Solomon from a merchant called Tamrin, how he worshiped God and his skills building a great Temple in Jerusalem. The Queen of Sheba decided to visit and see for herself King Solomon's wisdom, how he worshiped God and his many skills. When the Queen of Sheba visited King Solomon in Jerusalem she gave him many gifts and she asked him many questions, which he was able to answer. According to the legend of the Ethiopian history, while she was with him; King Solomon made Queen Sheba promise not to take anything from his house. King Solomon went to bed one night on one side of the chamber and Queen Sheba went to bed at the other side of the chamber. Before King Solomon slept, he placed a bowl of water near Queen Sheba's chamber. As she was thirsty, Queen Sheba woke up at the middle of the night and found the water, which she drank. At this point Solomon heard noises, woke up and found her drinking the water. He accused her of having broken her oath not to take anything from his house. Nevertheless the beauty of Queen Sheba attracted King Solomon and the relationship between King Solomon and Queen Sheba was consummated, resulting in the birth of a son named Ibn-al-Malik (known as Menelik), the founder of Ethiopian Solomonic Dynasty. The queen of Sheba heard of Solomon's fame and came to test him with hard questions. She arrived in Jerusalem with a very large retinue, camels laden with spices, gold in great quantity, and precious stones. When she came to Solomon, she told him everything she had in her mind, and Solomon answered all her questions; not one of them was too abstruse for the king to answer. When the queen of Sheba saw all the wisdom of Solomon, the house which he had built, the food on his table, the courtiers sitting round him, and his attendants standing behind in their livery, his cupbearers, and the whole-offerings which he used to offer in the house of the Lord, there was no more spirit left in her. Then she said to the king, 'The report which I heard in my own country about you and your wisdom was true, but I did not believe it until I came and saw for myself. Indeed I was not told half of it; your wisdom and your prosperity go far beyond the report which I had of them. Happy are your wives, happy these courtiers of yours who wait on every day and hear your wisdom! Blessed be the Lord your God who has delighted in you has set you on the throne of Israel; because he loves Israel for ever, he has made you their king to maintain law and justice.' Then she gave the king a hundred and twenty talents of gold, spices in great abundance, and precious stones. Never again came such a quantity of spices as the queen of Sheba gave to king Solomon. When Menelik grew up (about 22 years old), he asked his mother who his father was and told him that it was King Solomon of Israel. Menelik told his mother that he wanted to go to visit his father in Jerusalem. He went to Jerusalem to visit his father and Solomon received him with great honour. Menelik stayed with his father in Jerusalem and learnt the Law of Moses for 3 years. Menelik looked very like his father, which confused the Israelites as they had difficulty in telling the difference between Solomon and Menelik. Because of this confusion they complained to King Solomon and asked him to send Menelik home. King Solomon said if they wanted him to send his son back home the high priests would have to send their oldest son and 1000 people from each tribe of Israel with Menelik. The high priests agreed to send their oldest son and 1000 people from each tribe with Menelik. Menelik then returned to Aksum, amongst those accompanying him was Azariah the son of the high priest (Zadok) of the temple of Jerusalem. Before the journey Azariah had a dream that told him to take the Ark of the Covenant with him to Ethiopia. Azariah did what the dream told him to do and he stole the Ark from the Temple, putting in its place a copy. Azariah told Menelik what he had done and Menelik was angry with him but Azariah convinced Menelik to take the Ark with them. Zadok, the high priest of the Temple, discovered the Ark's disappearance and informed King Solomon. King Solomon and his army followed Menelik but could not catch him. Whilst this was taking place Solomon dreamt that his son should have the Ark and he returned to Jerusalem and ordered his high Priests to keep its disappearance a secret. On his return to Ethiopia, Menelik founded the "Solomonic Dynasty" and the Aksumite kingdom adopted Judaism and the Law of Moses. The visit of the Queen of Sheba to King Solomon as mentioned in the Holy Bible signifies to the Ethiopians their claim to be direct descendants of the "Solomonic Dynasty". This shows that Judaic culture was established and followed in Ethiopia since the reign of King Menelik. When the Aksumite kingdom accepted the arrival of Christianity, during the reign of King Ezana in the fourth century, the Felashas (Beta Israel or Ethiopian Jews) refused to accept Christianity and continued to practise Judaism, which they still do today. The Ark of the Covenant is the most reserved holy relic of God's incarnate and became part of the Ethiopian Orthodox Tewahedo Christian belief. The presence of the Ark of the Covenant in every Ethiopian Orthodox Tewahedo Church and the belief in it, exert a profound influence on the imaginations and spiritual lives of many Ethiopians. According to the Ethiopian Orthodox Tewahedo Church, this priceless treasure (the Ark of the Covenant) still exists and rests in a small chapel in the monastic complex of Saint Mary of Zion church in Aksum. This makes Saint Mary of Zion the holiest sanctuary in Ethiopia. It does seems likely that the Ark was brought to Ethiopia when Menelik returned to Aksum from his visit to his father, King Solomon. Ever since the Ethiopian monarch claimed to be a direct descendant from the biblical King Solomon and the Queen of Sheba, and ruled Ethiopia in an unbroken line until the revolution broke out in 1974 which ended the Ethiopian monarchy. For more information about the history and the whereabouts of the Ark of the Covenant, visit www.jewishvirtuallibrary.org/jsource/Judaism/ark.html and www.ethiopianorthodox.org/amharic/holybooks/arkofthecovenent.pdf. The original church of Saint Mary of Zion was built in the fourth century during the reign of King Ezana who converted the Aksumite kingdom to Christianity. A replica of the Ark of the Covenant, known as the tabot (the tablet), is kept in the holy of holies (Maqdas) in every Ethiopian Orthodox Tewahedo Church to indicate that the church has been duly consecrated as no church is considered consecrated without a replica of the Ark of the Covenant. The Ark of the Covenant is now kept in a small chapel built in 1965 on the orders of Emperor Haile Selassie, which stands at the heart of Aksum's monastic complex of Saint Mary of Zion (Mariam Tsion) church. One holy monk is elected and charged with its care and preservation. The elected monk becomes the official guardian of the Ark and no one, except the elected Guardian (a monk) who looks after the Ark of the Covenant, is allowed to enter the chapel. Before the guardian dies, according to Aksumites tradition, he must nominate his successor. Aksum remained the capital where the coronations of emperors and empress were held until the reign of Emperor Haile Selassie. It has become Ethiopia's most important centre of Orthodox Tewahedo Christian faith with many archaeological remains of interest and historical significance. These include the palace of Queen of Sheba, tombs of King Ezana and King Gebre Meskel, the magnificent Stelae (obelisks), the bath of Queen of Sheba, the monastic complex of Saint Mary of Zion, the chapel which houses the Ark of the Covenant and the city's antiquities museum. Aksum is now one of the most visited historical city in Ethiopia. Holy Bible, The Old Testimony, The First Book of Kings Chapter 10 verses 1-10. Graham Hancock, The Sign and the Seal : The Quest for the Lost Ark of the Covenant. Touchstone Books, 1993.